"Howie Wing, A Saga of Aviation," was a children's radio serial about a young pilot and friends who foiled spies and smugglers with some fancy flying. Written by Captain Willfred Gibbs Moore, a flying reservist who served as a pilot in WWI, Howie Wing was considered authentic and educational." From Kellogg's and Howie Wing, by Kathy Hammel, Radio Recall, June 2007, the journal of the Metropolitan Washington Old-Time Radio Club. Earlier this year, in my tribute to Helen Jacobson Richardson, I mentioned having seen a newspaper clipping at Helen's memorial about the first dramatic broadcast in radio history made from an airplane, "Howie Wing, a Saga of Aviation." Helen was the stewardess. 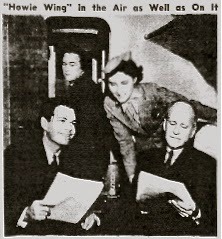 Below she is pictured with (l-r) Bill Janney, who played the part of "Howie", sound effects man Alexander Binnie and actor Robert Strauss on an unspecified United Airlines airplane, January 20, 1939. I visited the NWA History Centre and the Minnesota Historical Society, searching their Northwest archives for news of this flight. No luck. I entreated Helen Jacobson Richardson's children to search for the newspaper clipping I had seen at her memorial, still assuming that she was working for Northwest at the time of the flight. Mary Jo Nelson came up with the photo above and sent it to me. The photo's caption reminded me that Helen had flown for United before joining Northwest that same year, 1939. No wonder there was no mention in Northwest Airlines archives anywhere. The clipping Mary Jo sent me had no source or date. I took it back to the Minnesota Historical Society to their Gale Family Library newspaper collection and found the above clipping in The Minneapolis Star, Jan. 20, 1939. In the process Lady Skywriter became enamored of Howie Wing, and set out to find out more about him. I discovered a wonderful resource for old radio shows, The Metropolitan Washington Old-Timer Radio Club. I requested information about Howie Wing, and was put in touch with Jack French, editor of Radio Recall, the organization's newsletter. He, in turn, referred me to Kathy Hammel, their Howie Wing expert. Kathy responded immediately and began educating me on Howie Wing. Stay tuned to learn more about Howie Wing, A Saga of Aviation.